All countries seems to have their own traditions regarding Shrove Tuesday, many of them involving eating various rich foods. It seems very common to eat pancakes at this day around the world and Britain is one of the places that celebrates “Pancake day”, another name for Shrove Tuesday, named so because of the extensive eating of pancakes. We Swedes likes to be different. For starters, we like to give our Swedish things names that in English mean funny and silly things, not intentionally but all the same, for example we have Plopp (a toffee filled chocolate bar) and Pigall (another chocolate bar with an extremely sickly filling) and of course Shrove Tuesday is no exception. We named this day Fettisdagen. You can read this as either Fet-tisdagen or Fettis-dagen, one meaning Fat Tuesday and the other Fatty-Day. The other thing we do differently is that we don’t eat pancakes on Fatty Day, instead we eat something called semlor. A semla is a round cardamom bun filled with marzipan, whipped cream and topped with sifted icing sugar. The dough used to make semlor is just a normal bun dough used for normal cinnamon buns, but shaped into round balls instead of rolled out. You know that I had bad eating habits when I grew up, whenever we had a sweet treat we were given big portions and often seconds. 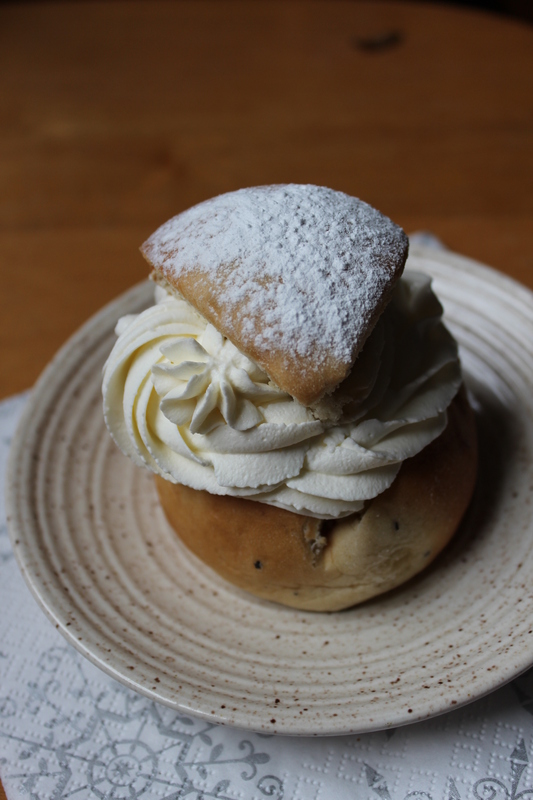 Semlor is no mistake, most people only have one semla and that is an adequate serving. In my family you were given two. I, however, even to this day always feel like I could probably eat three without any problems. I don’t recommend eating more than one or two if you must, because you can die of it which the Swedish king Adolf Frederick did after supposedly eating 14 semlor amongst other things. Some people like to eat their semla as a hetvägg (literally meaning hot wall) which is when you warm some milk and serve the semla in it in a bowl. This isn’t the most common way to eat a semla but it has its followers. Common or not, if you happen to get many leftover buns that might be stale after a few days this is a good way to make them nice and moist again. This entry was posted in Buns, Other desserts and tagged buns, Fettisdagen, semlor, Shrove Tuesday, whipped cream. Bookmark the permalink.